2019 Canadian Maple Leaf Silver Bullion 1 oz (.9999 pure) - Monster Box of 500 pieces. 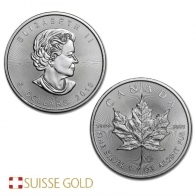 The silver Canadian Maple Leaf coin is produced by the Royal Canadian Mint. The coin features an image of Queen Elizabeth II on the front, with the coin's face value and year of minting beneath. 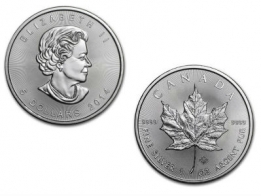 Each 1 Ounce silver Canadian Maple Leaf coin has a face value of 5 CAD. The reverse of the coin features an image of the iconic Canadian Maple leaf, with the coin's fineness, metal, and weight. 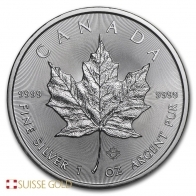 The silver Canadian Maple Leaf is one of the few silver coins produced today that is 9999 fine. The monster box of Canadian Maple leafs contains 500 x 1 ounce silver Maple Leaf coins, in 20 x tubes of 25 coins each. It is a very popular option for individuals investing in silver. The Royal Canadian Mint also produce several lines of special edition silver maple leaf coins, including the Bird of Prey and the Wildlife series. The Canadian Maple leaf coin is available in gold, silver, platinum and palladium. The Royal Canadian Mint also sell a series of gold and silver bars to precious metals investors. 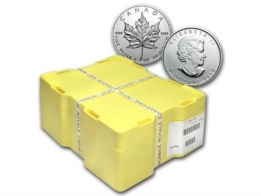 The monster box of silver maple leafs is popular with individuals that wish to buy silver coins in large quantities. To sell silver Maple Leafs, please contact us. View the current silver price per ounce.